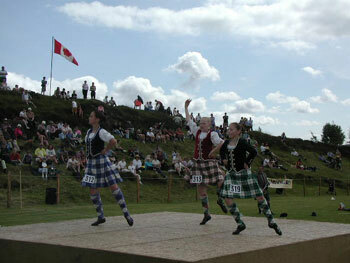 Highland Games are a very popular traditional summer event all over the Highlands and Islands of Scotland. Few, however, can compete in terms of setting with those set in Mull. With a perfect site overlooking The Sound of Mull, Morvern and Ardnamurchan, the games have a picture postcard backdrop that adds scenic beauty to the drama enacted on the games field. With traditionally kilted strongmen picking up, walking with and then tossing the caber, others swirling round and throwing the hammer, and teams of determined men struggling to gain ground in the tug o’ war its an exciting, invigorating atmosphere even for a spectator! Locals and visiting runners compete in the hill running race, disappearing from the games field whilst Pipe Bands entertain the crowds with their music and marching and Scottish Country Dancers perform on stage. With stalls and refreshments there is something for everyone at the games and a photo opportunity not to be missed. The games normally start at about 10.30am: A schedule of events is published on a local website close to the start of the games.